On this class we will cover the first ways we can interact with user to allow our application to get information from drawing screen You probably will need to use this method inside your application. This is one of the most important ways to interact with user because it will allow you to get information from drawing screen through selected entities. Some times you will request user to select entities individually and sometimes you will select them using a filter. This function receives the ads_name and convert it to an AcDbObjectId. Most of selection set functions will still use the ads_name as parameters and on theses cases you don't need to convert it. The ads_name can store several entities or just one. This will depend on how you or the user has performed the selection. To modify entities inside a selection set we need to walk through selection items, get each one, convert the ads_name to an ObjectId, open the entity for write, modify it and then close it. This operation can also be done using a transaction which is, in long operations, much better. I have used some new functions (like acdbOpenAcDbEntity) that are also part of ObjectARX SDK. Pay attention to the memory releases regarding to selection set and resbuf types. Note that I have used also a function called acedSSLength() to get the length of selection set. The acedSSName() function get an at the passed index. If we have more than one entity selected this loop will get every single entity into this selection set. 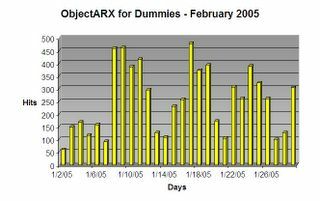 On this class I will present the concepts and features of ObjectARX container objects. We have talked a little bit about them before but now we will go into further details. The container object purpose is to store and manage objects of the same type or class. There are two types of containers: Symbol Tables and Dictionaries. Each type of container has some specific functionalities that were designed to allow easy and efficient access methods. This type of container is designed to store the so called records. Each Symbol Table object store its records using an unique entry name. Through this entry you can obtain the record pointer and read or write information. The container may also receive new entries or even has entries removed (in case they are not used by other objects). To walk through an object container entries you will need to use a proper iterator which will allow you to get entries and access its objects. AutoCAD has some Symbol Tables to store layers, linetypes, text styles and other objects. As these containers work almost the same way, there is a common base class for each of Symbol Tables, its records and the proper iterators. This type of container is designed to store generic AcDbObject derived class objects. This container is very useful because we can also store our custom objects inside it. The dictionary structure is much like a tree structure where we have nodes and entries. Inside the same node, entries can not repeat its name because they need to be unique inside the same level. These are the so called Key entries and each Key entry will map to an AcDbObject pointer which can be retrieved directly or through an interator (AcDbDictionaryIterator). To store an object we need to create an entry using the setAt() method passing also the object pointer which we already have instantiated with the new operator. After add this object we need to close() it. AcDbDictionary container will return the given AcDbObjectId for each entry. This container is also used by some AutoCAD features like groups and multiline styles. We will cover more about Dictionaries on the Custom Objects chapter. Hope you did solve this lab. I will present my solution now but this doesn't mean that this is the best or the only way to go. The first function, called addtoModelSpace() is a generic utility function which adds an arbitrary entity to ModelSpace and return its ObjectId. Following this function you will find two functions that were linked with CENTS and CHENTS commands. All 3 funtions are placed into your application class. Pay attention to the code flow and be careful to not forget any braces or close() methods. You may download this sample from here: ARXLAB1.zip! Entities are objects that has a graphical representation. They could be simple or complex depending on how many features and functionalities they implement. Entities are stored into BlockTableRecord container objects. Each of these containers will keep its entities until they are erased or Database is destroyed. As any other database resident object, each entity can be accessed through its unique ObjectId. Using its ObjectId we can then acquire its pointer (for Read, Write or Notify as we saw on previous class) and then perform desired operations. Some special entities contains also another objects to simplify implementation and management. A good example of this approach is AcDb3dPolyline which has a collection of AcDb3dPolylineVertex objects that represents each of its vertexes. AutoCAD entities has several properties and some of them are common to all kind of entity. These properties are stored into entity's base class called AcDbEntity. This class, also derived from AcDbObject implements several common functionalities that will be used by every derived class and related implemented entity. These properties has specific access methods that will allow you to read or modify them accessing the AcDbEntity base class. So, if we get our AcDbCircle entity and would like to change its color we just need to open it for Write, access the proper method and then close the circle. If we need to build an application that only access these properties we really don't need to know what kind of entity we are opening. In this situation we just need to open our entity, get its pointer as an AcDbEntity pointer and access the desired method. Each AutoCAD entity is placed into a 3D space. You already know that we can move, rotate, scale, align and many other modifications over an entity. AutoCAD threats most of these operations using geometric algebra using matrixes. Remember that we have talked about ObjectARX classes and, specially in this case, about AcGe prefixed classes. The AcGe classes are geometric classes which will allow you to perform simple and complex geometric operations inside AutoCAD. So let's suppose you need to perform a rotation over several entities (circles, polylines, lines, etc.) and need to do this with minimum effort and basic geometric knowledge. No big deal! We just need to build a transformation matrix and call the appropriate method called transformBy() implemented by AcDbEntity class. Yes, every entity could be potentially transformed! This function receives an object of class AcGeMatrix3d which represents the matrix to be applied to the entity that will perform some geometric operation. This could be a transformation matrix, a rotation matrix and so on. setToMirroring: This function has 3 versions that receives a point (AcGePoint3d), a line (AcGeLine3d) or a plane (AcGePlane). Depending on what type of parameter you pass in it will build the proper matrix to mirror your entity! Great hum? Another important functionality implemented at AcDbEntity level is entity intersection. Probably one of your future products will need to analyze entities intersections. The method intersectWith() is the responsible to do this job for you. The most common signature of this method receives the argument entity pointer (the entity you would like to test with yours), the intersection type, an array of 3D points to be filled out by this functions with intersection points found and, optionally the GS marker of both entities which represents the subentity index. If these two entities intercept each other (obviously depending on which type of intersection you specify) the passed array will receive the intersection points. This function is very useful and uses the core geometric engine of AutoCAD which make it fast and reliable. Our next class will be a demo example and I would give you a couple of days to accomplish it and then I will post my solution to it. Stay tuned! On previous class we have talked about object lifecycle. On this class we will go further on how to manage AutoCAD objects. As I have mentioned every object has its own identification called ObjectId. This is the key for acquiring its pointer and perform read or write operations. The standard access method is made by an OPEN operation (for write, for read or for notify), some operations and a CLOSE method. Another approach, much more efficient is through transactions. This mechanism is much more secure and efficient. Let's talk about both methods. This is the most used method but, in other hand, is the most unsafe because you may forget to close the object and then cause access violations or even fatal errors that will cause AutoCAD to terminate. This function receives an empty pointer to AcDbObject by reference that will be filled out by AutoCAD if there is an object with the provided input variable id. Further you need to provide your action intention on the object which can be WRITE, READ or NOTIFY. The latest parameter indicate if you would like to open the object if it is on erased status. Remember we have talked that erased objects remain inside AutoCAD database until the next save operation. The opening intention is very important because it will limit or not what you can do with the object. If you open an object for READ you will not be able to call methods that modify the object's state. In other hand, if you open the object for WRITE you will be able to both modify and read object data. Ah, so is better to always open the object for WRITE? When you open an object for WRITE AutoCAD fires several pre and post procedures on it that causes some performance overhead. If your routine opens several objects and you use the WRITE flag you will certainly loose performance. Transactions are a better and much more efficient method to manage objects. They can be nested and this allows you to perform long operations without the limitation of READ and WRITE states. Basically you need to open a transaction, perform your desired modifications, and at the end, perform an end or abort transaction operation. Transactions are pretty good to use when your application uses dialog boxes that change objects. At your dialog opening you start a new transaction and, depending on user click on OK or CANCEL button, you call end or abort transaction methods. When you abort a transaction the whole contained modification are cancelled. In fact, modifications are really applied only when you end a transaction. Another great feature is that you can open an object for WRITE several times as you can open for READ at the same time. This time you open the object using the getObject() method which is much like acdbOpenObject() but YOU DON'T NEED TO CLOSE the object. The whole process is ended at endTransaction() method call. At that time all operations are applied in one operation. To access course files Click Here! Thanks to OFCDesk LLC for hosting my files. Now you are able to create a minimum ObjectARX project we will continue the course with some additional concepts. As I have mentioned before, AutoCAD's database is well organized to allow simple and direct manipulation of its objects. Generally we have two basic types: Containers and Objects. Containers are special objects that provide a simple and efficient mechanism to store, edit and persist objects or collections. They are optimized to allow quick access with minimum overhead. Each type of object has an appropriate container where you should always store your object. There are several containers inside AutoCAD's database but some of the most common are: LayerTable, LinetypeTable and BlockTable. Each container class has standard access methods and most of them also offer a companion class to iterate through its items. Every time you create an object and would like to store it inside AutoCAD's database you need to follow its container protocol to store and persist is as well. In other hand, Objects (including entities) are the most basic types and represent each element inside AutoCAD. They are implemented through specific classes with standard and specific methods. Some of them could be derived inside your application to allow customization. Every database resident object has an exclusive identification called ObjectId. This identification is the "name" of each object inside database and it is used to reference, open and manipulate objects. This could be a difficult concept for those who are fluent in standard C++ language because inside ObjectARX you don't delete a pointer to a database resident object. What? Yes, this is a little bit strange but AutoCAD has several reasons to do that including performance, memory management and other aspects. So, how can I manipulate objects? 1) Database resident objects should never be deleted even you have erased them! 2) If you have allocated an object but did not added it to database yet, go ahead...delete the pointer! Most of bugs you will face at your first application will be have something to do with the above rules. Trust me! Objects can refer each other using their ObjectId. This can be an ownership relation or just a relationship. If you think about a layer you will understand what is involved with this concept. The LayerTable container owns its records which are objects (Layers in this case). Each Layer ObjectId is referred inside each entity. Exactly due that you can't remove a Layer from a DWG file until all entities that uses this layer are erased or has its associated layer changed. There are several examples of ownerships and relationships inside AutoCAD. During our course you will get this concept easily when we have to manipulate basic objects.